The last few days have been really cold. I mean like -40 degrees Celsius with the windchill kind of cold. Too cold to have the kids outside playing. Which as a result leads to 3 kids who are going stir crazy and a Momma who is ready to lose her mind because she can’t get 3 minutes to drink her coffee. Or load the dishwasher. Or cook. Or pee. It means Alex, Nick and Zoey fight. Over everything. And hit. And push. And argue. And whine. I think you get the picture, it’s miserable. Over the last few months I have become a little addicted to Pinterest. 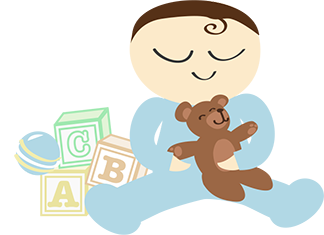 There are some AMAZING ideas on how to entertain kids! Oodles and oodles of ideas! And so many of them use things I have around the house. Like tape. And balloons. And string. And straws. It has been a life saver. There are far too many pages that I have been going to for ideas for me to link to exactly where I find my ideas, but this (and this, this and this) is the link to my board where I store them all! Feel free to take a look. First up, we have our noisy balloons. I put perler beads into the balloons and blew them up. 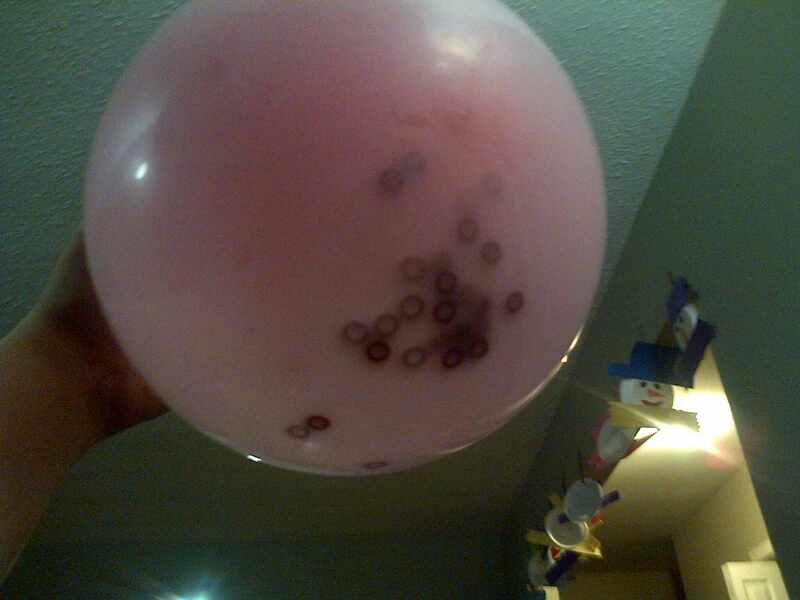 The beads bounced all over the place when the balloons moved and made tons of noise. I used beads, but I imagine you could put anything in them that you had around the house to make noise! The kids were entertained for a couple hours by these when I first made them and they were used on and off all day today as well. I would say it was a hit! I am always on board for any activity that includes some learning. My kids love tape and they love to guess what I might be doing with it. 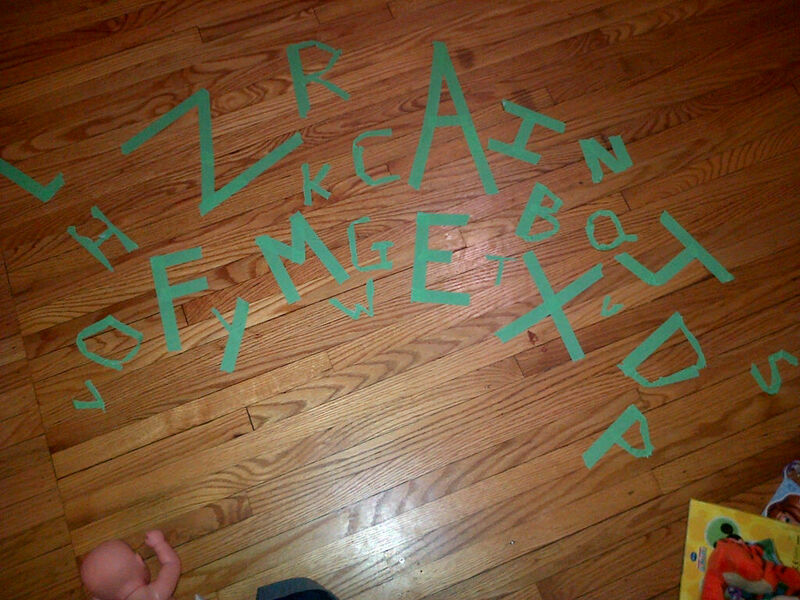 (Usually I am making them a roadway/city/parking lot for their cars and trains) So I sat on the floor while they were being loud and started making some letters. We had fun singing our alphabet and guess which letters were missing (I didn’t tape them down in order and that added to the appeal of them guessing which one I was making) Alex also liked finding letters to spell some simple words! Today the kids really wanted to play in the snow. Since we couldn’t go outside and play in the snow, we brought the snow into us. I also put some water into the muffin tins with some food coloring and let the kids paint in the snow. They had fun making roads, and snowmen, and painting pictures. At one point there were dinosaurs in the snow fighting the ‘ice age’ (a snowman). 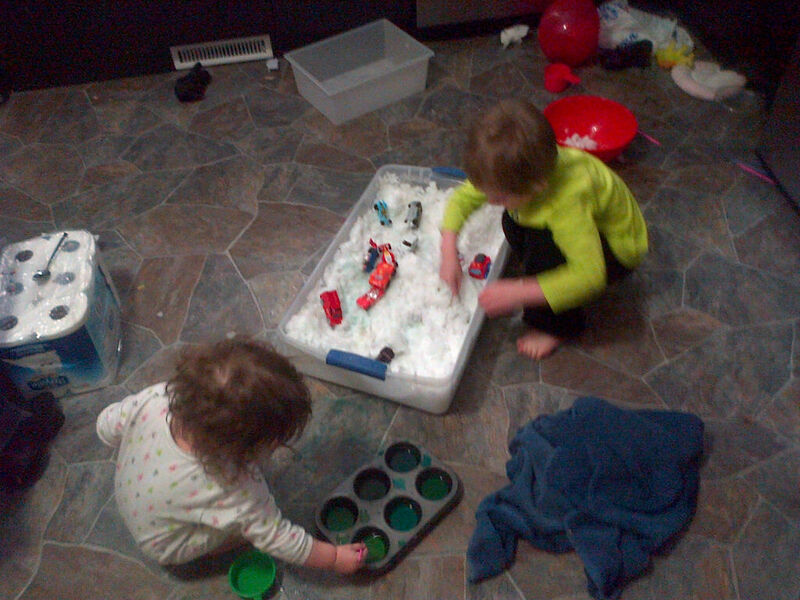 They had a great time playing in the snow and my floors were cleaned in the process! Double win!